It has long been possible to buy E-ink screens and kits through electronics supply warehouses or through niche sites like AdaFruit - all that you needed was a credit card and a web browser. Now E-ink is selling the screens units themselves. 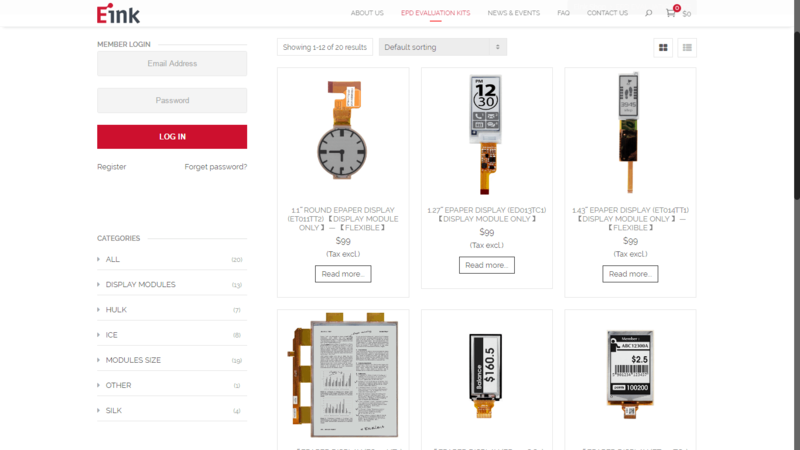 E-ink has quietly launched its first direct retail site. The store has been under development since April(*), but was only discovered this week. The site is in beta, and it currently carries 20 different screens with sizes ranging from a 1" circular smartwatch display to a 32" rectangular signage. Prices range from $99 for that 1" circular display up to $2,000 for the 32" sign unit. While most of the screens are grayscale, E-ink does offer a number of the 3-color Spectra screens in a variety of sizes, including at least one size (5.83") which I have been unable to find elsewhere. It's not clear why E-ink is getting into direct retail; DIY is not a big market (if it were, Amazon would be selling these screens). But one detail suggests that this is less about sales than market research. E-ink won't sell you a screen until after you tell it how you want to use it. Customers have to select an option (ereader, wearable, eNote, shelf label, signage,etc) from a drop down. There's no restriction on how you can use a screen - you could for example use the 1" round display for an ereader - but E-ink does want to know the intended use. So apparently E-ink has decided that it needs to know more about how its tech is being used. That's a good idea, but wouldn't it be cheaper and more effective to buy mailing lists from retailers and run an email survey? P.S. Ask me how I know the site has been under development since April. Go on, ask. P.P.S. The store is running on WordPress, and it uses WooCommerce and the Atkina theme plus common plugins like Contact Form 7.Looking at the code tells us that the first product photos were uploaded in April 2016. I don’t understand why it is SO Expensive ? The HULK Kit at 399$ ? A simple kindle is 60$ for a 7″ screen with an OS, a browser, a battery, wifi, with a clean package. If they want makers to build multiple usecase with their sreens they have to change the way to think about that. The Kindle is mass-produced by the tens of thousands. These screens are produced in much smaller production runs, which means the cost of each run has to be divided among a smaller number of units. That raises the cost. I agree but people will hack the so many mass product screen available on Alibaba instead of paying 10x the price here. ok, I’ll bite; how do you know the website was under development since April? References in the code for when certain pages went online.